Pins matter. We use pins to get things to line up better as we sew. But some pins work better than others. When most non sewers think of pins, they think of a pointy pin with a round ball on top. 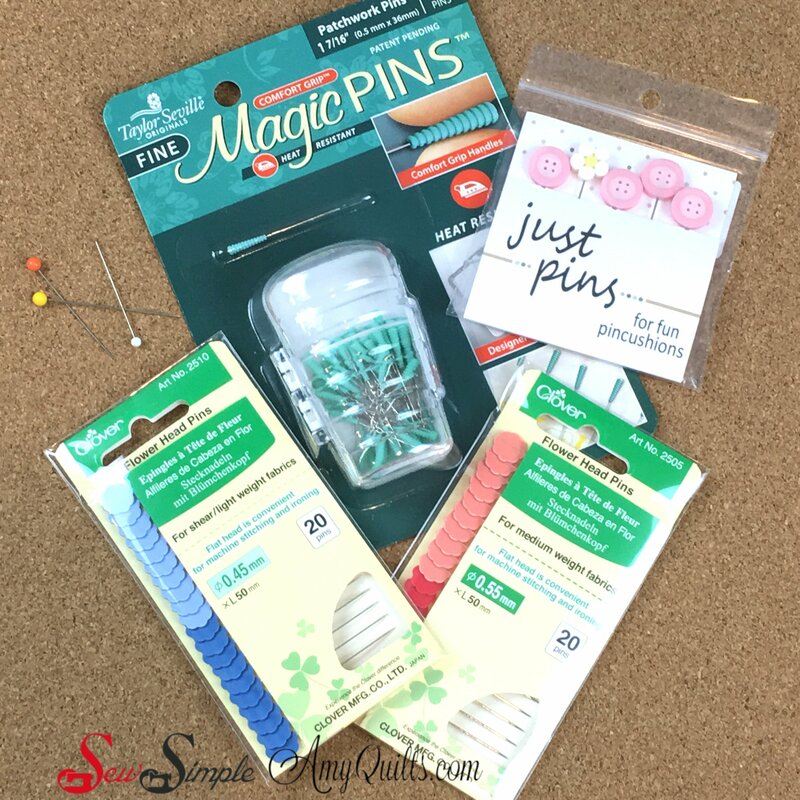 Those are pretty common and a fairly standard item, but did you know they aren’t the best pins for precision projects? My favorite pins are flat head pins. Flat head pins allow the fabric to lay nice and flat on the sewing machine bed, whereas round head pins lay at an angle and can interfere with how the fabric feeds as it gets to the feed dogs. If one side of the feed dogs catches the pin, the fabric will shift to one side. Did you know pins come in different sizes too? Not just length, but also fineness. Stouter pins are good for tougher projects like denim and canvas. But fine pins go into quilting cotton and fine fabrics much easier. Longer pins also give a bigger “bite” on your project for more secure pinning. If you do fine needlework or applique, we even have teeny tiny “Perfect Pins”. Above are some of our pins. Going clockwise from the top right are fancy decorative pins. These are adorable in a pincushion, but don’t plan on using them on a sewing project; they are quite thick. Next are standard Flower headed flat head pins. These are great pins for heavy projects. Next come my favorite pins. They are much like the previous pins, but they are finer and slip easily into my piecing projects. I like that their blue color tells me at a glance that they are fine and so I can easily grab which pin I need. I hate to bend these when it’s time to work on a denim tote bag. (That was our Simple Sewing Series project this month!) Above them, you can see your standard round headed pins. I had to search hard for these as I don’t use or sell them in the shop. Finally, we come to the Magic Pins. These are absolutely fabulous if you have trouble grasping flat or fine headed pins. They lay flatter on the bed of the machine than the average round headed pin and are made of a soft, easy to grip, heat resistant silicone material. There are two versions of these pins and we only carry one version: the fine ones. I tested the original version and found them to be too thick. I hope you found this tip useful. Pass it along if you like, sharing is caring. My mantra when it comes to free motion quilting is, “practice, practice, practice!” Especially while teaching a beginner’s class. I encourage beginners to doodle designs and practice stitching first without thread, then doing a bunch of practice pieces. Pot holders and quilted mats for fur babies make good practice pieces, followed by place mats. 8 free motion quilting tips for confident beginners. But when you just can’t stand to do another practice piece or an emergency quilt project comes your way, there are some tricks to help your free motion quilting look its best and I’m linking a previous article of mine here for you. These tips have to do with your set up, batting, thread choices and color, backing, and doing what you can to relax during the process. 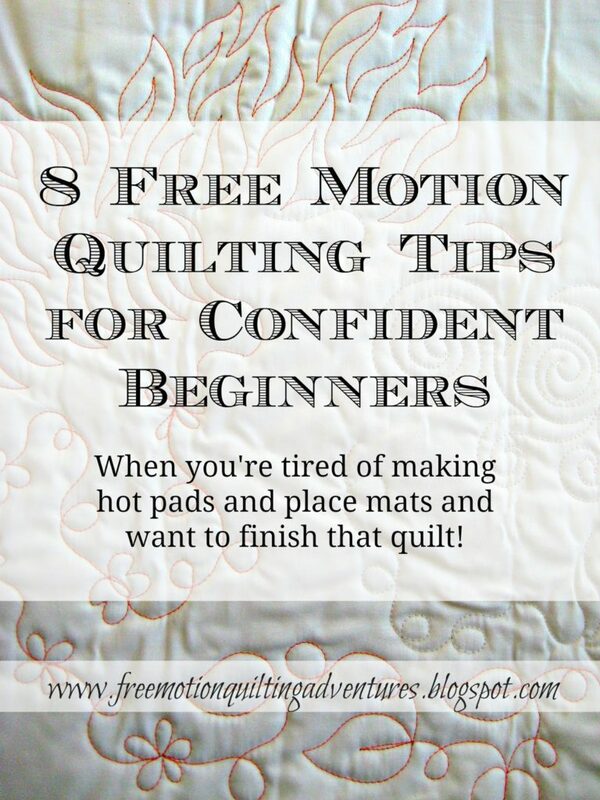 Click here to read the article: 8 Free Motion Quilting Tips for Confident Beginners.